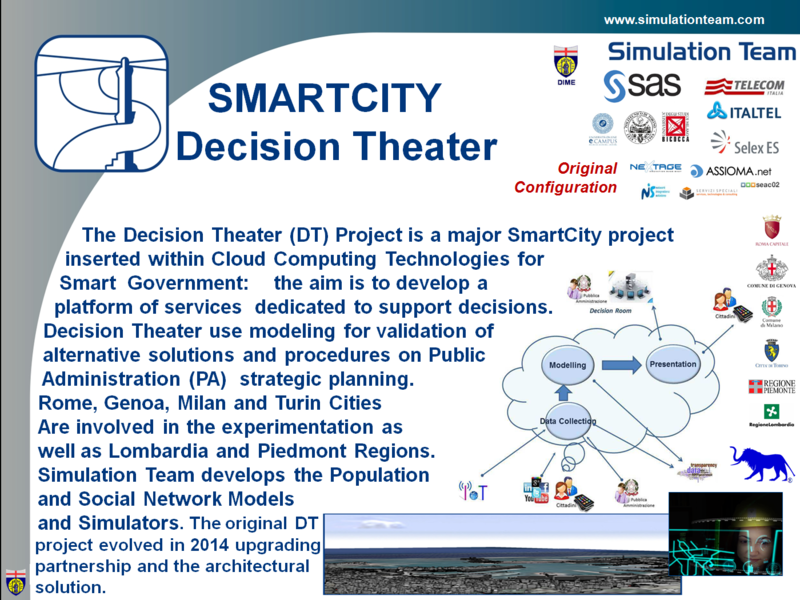 The Decision Theater (DT) Project is a major SmartCity project inserted within Cloud Computing Technologies for Smart Government: the aim is to develop a platform of services dedicated to support decisions. Decision Theater use modeling for validation of alternative solutions and procedures on Public Administration (PA) strategic planning. Rome, Genoa, Milan and Turin Cities Are involved in the experimentation as well as Lombardia and Piedmont Regions. Simulation Team develops the Population and Social Network Models and Simulators. The original DT Project evolved in a New Configuration in 2014, upgrading the partnership and the architectural solution. The Decision Theater simulator supports population modeling, decision making and crowdsourcing.